WOODLAND LILIES ARE shade-loving perennials with attractive, bell-shaped flowers and ornamental berries. There are various species of woodland lilies, but all are closely related members of the Asparagaceae family. Some of the most attractive ones are native to our Pacific Northwest mountain forests. Fairy bell (Prosartes smithii), False Solomon’s seal (Maianthemum racemosum), clasping twisted stalk (Streptopus amplexifolius) and rosy twisted stalk (Streptopus lanceolatus var. curvipes) are beautiful plants that enhance any shade garden. These native wood lilies emerge from the ground in spring. They form zig-zaggy arching stems covered with dark-green leaves, and can grow anywhere from 1 to 3 feet tall. The main difference is the flowers. Fairy bell produces one to three delicate bell-shaped, white flowers at the end of each branch. 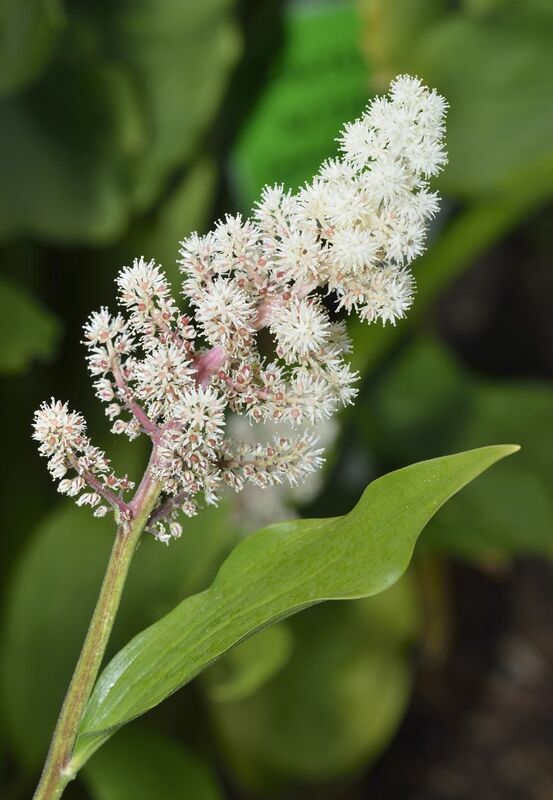 The snow-white flowers on False Solomon’s seal appear in feathery plumes at the ends of the stems. Twisted stalk produces one or two greenish-white, bell-shaped flowers under each leaf on thin, twisted stalks (hence the name). The flowers on all three of these natives are followed by very ornamental, nonedible red or orange berries (loved by birds) in late summer and fall. Although it isn’t native to our region, another popular woodland lily is an East Coast native, Solomon’s seal (Polygonatum biflorum). It produces dangling pairs of creamy white flowers in late spring, followed by berries that eventually turn black. There are also incredible wood lilies that grow in Asia, and thanks to the efforts of plant hunters who have collected and brought back seed, it is now possible to find amazingly beautiful species at specialty plant sales and online nurseries. 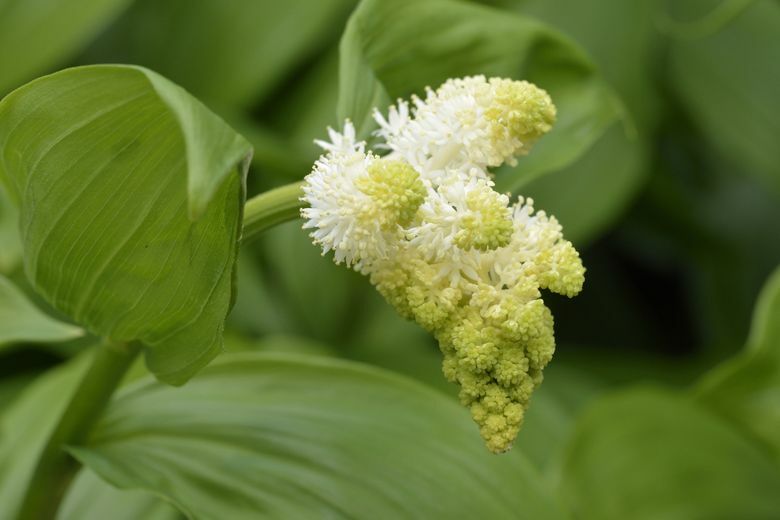 A truly magnificent Solomon’s seal discovered in the higher elevations of China is Maianthemum oleraceum. The ones with white flowers develop graceful, arching stems to 18 inches with spectacular 6-inch-long, red-stemmed, snow-white feathery plumes at the end of each branch. Even showier is the pink flowered form. 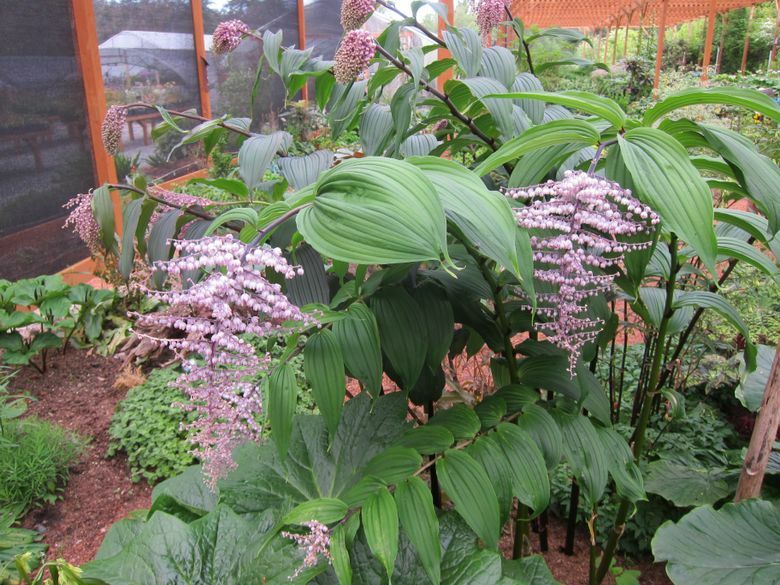 The arching stems on this one can reach more than 5 feet long, culminating in huge clusters of pinkish-purple flowers. There are some extremely showy Asian Solomon’s seals available, as well. Polygonatum kingianum is a real stunner. The stems on this behemoth tower straight up to 8 to 12 feet tall, but what puts it over the top are the huge clusters of showy orange-red flowers that appear in every leaf axel. Smaller in stature, but just as desirable, is Polygonatum lasianthum ‘Hakkoda Smoke’. 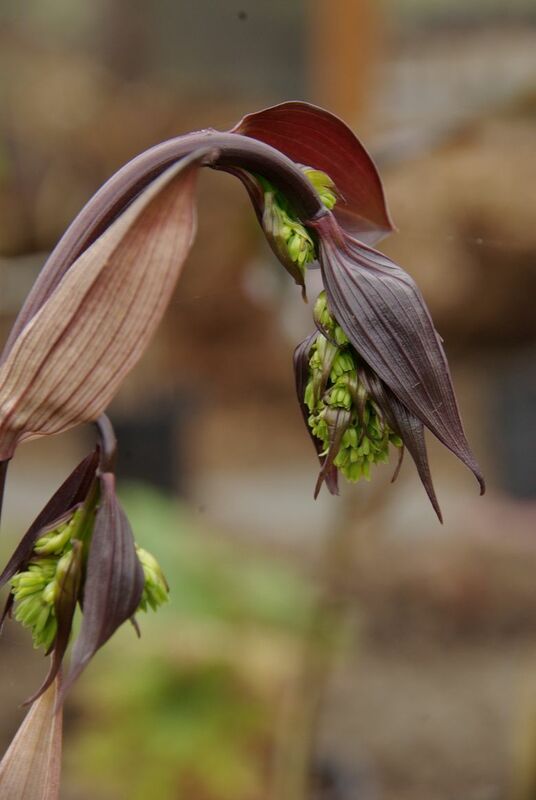 This rare selection from Japan grows to only 15 inches tall, but has reddish, smoky-tinged foliage that blends beautifully with small, pale bell flowers. Finally, without doubt, some of the finest woodland lilies are the fairy bells in the Disporum genus. If you’re into diminutive plants, an irresistible cutie is D. sessile ‘Goldbug’. Growing only 4 to 6 inches tall, this munchkin puts on a big show, with eye-catching green leaves banded heavily with stripes of bright cream and yellow. Its white spring flowers are huge for a plant of its size. But it’s the tall-growing fairy bells that really steal the show. 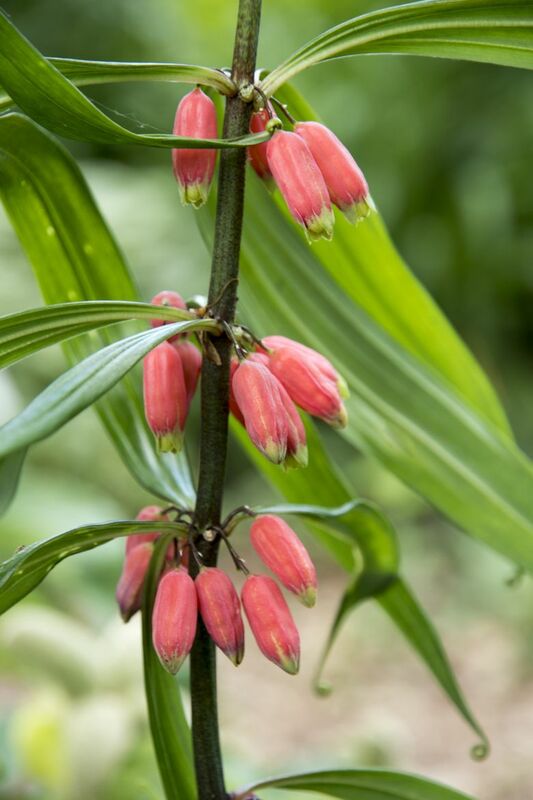 D. cantoniense ‘Green Giant’ emerges in spring with zigzag bamboo-like shoots in shades of pink, white and green that quickly reach 6 feet tall before maturing to deep green. In spring, fragrant, creamy white flowers occur on branch tips, followed by glossy black fruit in fall. But the queen when it comes to exotic beauty has to be D. cantoniense ‘Night Heron’. This dark-leaved selection from a seedling of ‘Green Giant’ grows almost as tall, but its leaves and stems emerge dark purple, contrasting beautifully with its chartreuse flowers. As summer progresses, the foliage matures to glossy, smoke-tinged green. The foliage remains evergreen, but is best cut down to the ground when new growth appears in spring. 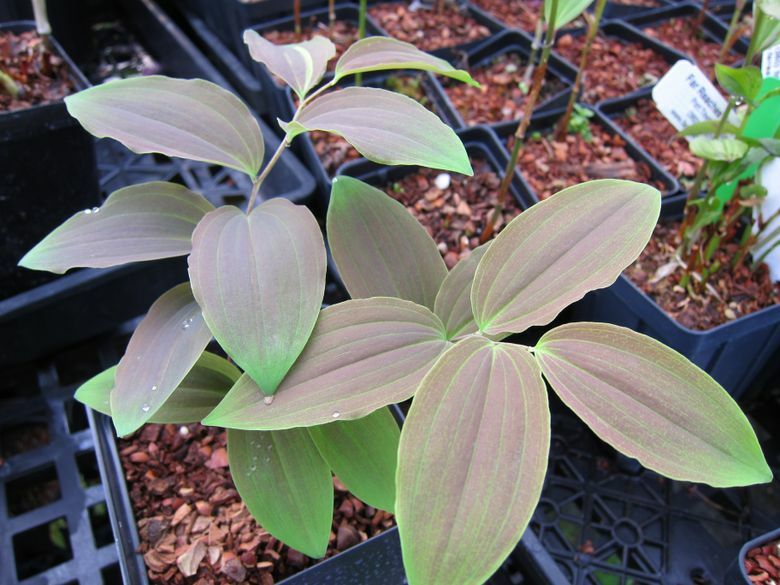 Grow this one in morning sun to bring out the rich, chocolate tones in the foliage. All of the woodland lilies described above do best in bright shade or morning sun, in rich, well-drained, moisture-retentive soil. As a general rule, Asian species require regular watering, while native species need to be watered only in very dry conditions.